Animal lovers of the world are in for a treat when they witness how this three-legged pit bull cares for a group of orphaned kittens. Watch as Bella nurtures, cleans, and cozies up with the little cuties who obviously adore their unorthodox foster parent. They might be two completely different species, but this is a touching case of love knowing no boundaries. Every year, 1.4 million stray cats have to be euthanized, ASPCA reports, so to see this story is just heartwarming. The fact that Bella only has three legs makes it even more touching. Bella doesn't look at herself as having a deficiency, and in spite of her condition, doesn't let it slow down her efforts to show compassion towards these kittens. It's no secret that pit bulls have a polarizing reputation in society, but if you've ever needed proof that they are just as caring as any other breed, here you have it. 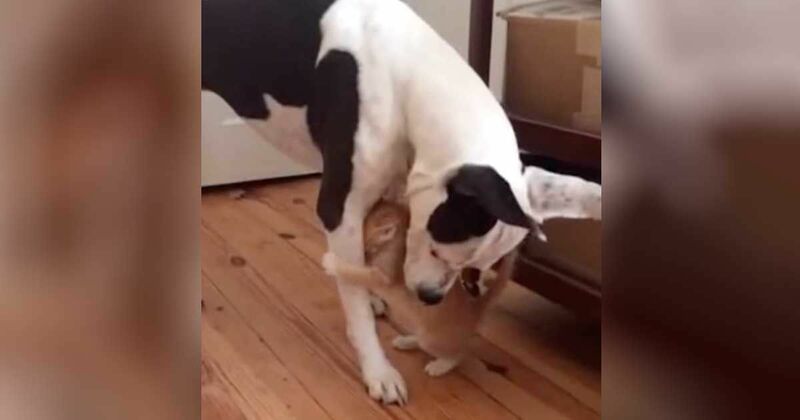 One of the most darling scenes of this YouTube video shared by Grace Kuhn in May, 2015 is when one of the kittens is licking Bella's ear, as if to say, "Thanks for taking care of us momma, now I want to take care of you." It's almost impossible not to start grinning ear to ear as you watch it. This video reminds us of a lot of things. It reminds us to not judge a book by its cover, to show compassion and love towards all creatures even if they look different than we do, and that sometimes a video is all we need to lift our spirits and make us smile. Let us know how this video touched you, and spread the love if you enjoyed it as much as we did.